10 Ways Talk Yourself Out of Your Next Great Idea - HELLO, my name is Scott! Do you want to dramatically shrink your creative output? Are you seeking to smother your brain’s finest impulses? 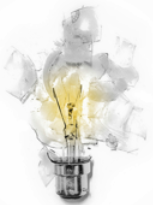 How about removing any shred of hope for innovative thinking at your organization? 1. “That’s stupid!” Always prejudge the quality of your ideas by assigning value to them early. This forces premature cognitive commitment, which prevents your creativity from expanding into unexpected territory. After all, the last thing you want is your imagination to run wild. That’s sounds like something Einstein or Edison might do. And what did those two geniuses ever contribute to society? Nothing but a bunch of revolutionary ideas that changed the face of mankind forever. Pshht. Crappy geniuses and their stupid creativity. 2. “That’ll never work.” Never experiment with anything. It’s too expensive, too risky and too dangerous. Instead, feed yourself a steady diet of misguided assumptions and bureaucratic propaganda to poison what’s left of your childlike playfulness. This assures the lowest possible level of movement value in your ideas, thus rendering your creative abilities to an embarrassingly low level, the likes of which your tax account would be legitimately impressed by. 3. “I’m not allowed to do that.” The last thing you want to do is think for yourself. So, before taking any sort of creative risk, be sure to stop and consider the dozens of unwritten rules that you can’t prove and have mindlessly accepted since childhood. That’s the key to embracing inertia and becoming creatively constipated for years to come: Holding fast to your assumptions in the face of zero evidence. 4. “I should really wait until I have hard data.” Smart move. After all, trusting your intuition means relying on dependable, physiological indicators like feelings and bodily reactions. And all those things will ever do is tell you the truth. That’s no good! Who has time for honesty when your DVR is 96% full? Look: When you’re trying to talk yourself out of a great idea, instinct is about the stupidest road you could travel. Dishonesty is the best policy. 5. “That’s not logical.” Talking yourself out of any great idea is a function of your insistence to think literally. The secret is to create a filter of rationality to myopically evaluate every idea that comes into your brain. That way, anything that resembles a threat to the status quo can be put to rest before it sneaks its way outside of the creative box. This enables you to preserve a cozy state of predictable mediocrity while simultaneously thriving in hopeless condition of execution-free inconsequentiality. Those great ideas won’t stand a chance. 6. “Yeah, but I can’t just…” These five words are as good as money out of the bank. I suggest you recite this golden nugget of growth-limiting self-talk on a daily basis. Soon, your self-confidence will be lower than a chemical engineer’s at a Toastmasters convention. As long as you remember the following truths: You’re not good enough. You shouldn’t trust your resources. And you have no right to demand originality in anything you do. 7. “Who am I to…?” Nobody, that’s who! Save the creative ideas for the marketing department. You’re not paid to think – you’re paid to drag your unmotivated carcass into the personal hell known as your cubicle so you can spend the next nine hours of your miserable life staring at videos on YouTube that slowly dissipate your brain’s capacity to achieve independent thought. Which reminds me; don’t forget to TiVo Dancing with the Stars tonight. I think that guy from Real World Seattle is going to win. 8. “I’m never wrong.” Be very careful. If you’re stupid enough to be vulnerable, you’ll never talk yourself out of any great idea. My suggestion is to maintain a constant posture of terminal certainty. Not only will this create an arrogance clamp that prevents new information from penetrating your mental defenses, but it will piss off your coworkers to no end. This will be helpful in blocking their creativity as well. Hell, maybe you’ll get fired. Hope you like sleeping in on weekdays! 9. “That’s not the right answer!” In life, every problem has one answer, and one answer only. That’s it. How dare you leave space for ambiguity? Life is a scantron test, not an essay contest. Don’t get sucked into the vortex of uncertainty. Otherwise you’ll have to depend on the very creativity faculties that your agenda-ridden teachers, dogmatic punch-drinking religious leaders and power-hungry authority figures have spent the last four decades trying to beat out of you. Instead, learn to think only in absolutes. Otherwise you’re going to die. Tomorrow. REMEMBER: Most great ideas are just waiting to be talked out of. I challenge you to incorporate these ten phrases into your uncreative life today. Who knows? With a little apathy, a lot of self-disbelief and a proven track record of requiring permission to think for yourself, you, too, could be the lucky person to discard the one idea that somebody else picks up and uses to change the world. What ideas did you slaughter yesterday? For the list called, “49 Ways to become an Idea Powerhouse,” send an email to me, and you win the list for free!